Could you walk me through the process of measuring and installing new window treatments myself? I’ve done several other projects around the house and I think I’m finally ready to tackle this one! Thank you so much for your help! Janet, your first step will be to measure your windows for the new blinds. Make sure you have a metal tape measure, pen and paper, and a step-ladder or folding ladder to stand on depending on how tall your windows are. It is very important that you use a metal tape measure and not a seamstresses measuring tape. The reason being that unlike a metal tape measure, a seamstresses measuring tape can be inaccurate based on how tight you hold its ends. This is why it is important to always use a metal tape measure for any home improvement project, as it will give you a true unbiased measurement. Once you’ve got all the needed tools assembled, decide where the blinds will be hung from. Are you going to hang them inside the window frame or mount them on the wall around the window? For inside the window frame, place the end of your tape measure inside the window frame itself, then measure from inside edge to inside edge. Do this in three spots for the width, and three spots for the height. This way, you’ll know whether you need to compensate for your windows being out of square. Do this regardless of how old the house is, older homes are usually the worst at being out of square, but newer homes aren’t perfect either. If your window is out of square, you’ll want to take the largest of all three measurements. 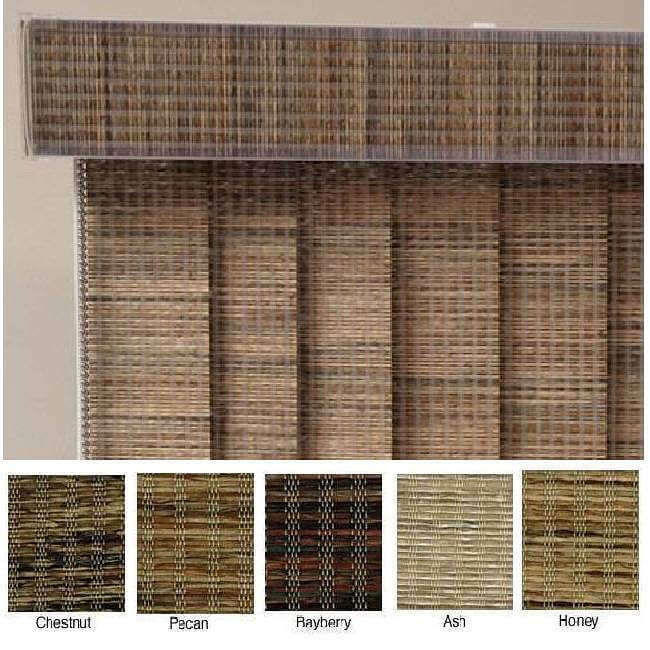 This could potentially let in more light around the window blind, but it is better than the alternative – which is your window treatment not fitting inside the window frame! For outside the window frame mounts, measure from at least 1-1/2 inches outside the window frame on either side. You may need to make adjustments to this number based on any obstacles or molding. A few tips to keep in mind: Try to avoid mounting your blinds into the moulding or trim work, because this will be noticeable if the blinds are taken down and not replaced. Be extra careful to check the area you are going to mount the blinds for electrical wires and adequate space. If your window butts up next to a cabinet, make sure you are checking your measurements next to that cabinet or another obstacle. Once you’ve written down the measurements for both the width and the height of your window, it’s time to purchase your new blinds. Make sure you write down the dimensions in width x height format (side to side, then top to bottom), and make sure the number is in inches, not feet. Once you’ve got this important number, you can go pick out your new window treatments! One of the biggest mistakes novices make when purchasing new window treatments, is not being ultimately clear with the salesperson on how the window treatments were measured. This is why it is important to stress to the salesperson that your measurements are your actual window dimensions and to make sure they know whether you are planning on installing them as an inside mount or an outside mount. The reason being that an inside mount typically has a 1/2 inch taken off the total width measurement, so that the blind will fit inside the window frame. While an outside mount is made to the exact measurements requested. It might seem redundant, but I always have the salesperson read back my measurements and the type of mount so that I can make sure we are communicating effectively and so my blinds will be made correctly. Make sure you follow the manufacturers instructions when installing the new hardware. Most instructions will tell you how many inches in from the edge of the window the hardware needs to be installed. Then using your tape measure and pencil mark where the new hardware will go. Hold the hardware in that place and make a mark where each screw will be placed. This way, you can start the hole of the screw without having to hold the bracket firmly in place. Giving you two hands to hold the drill and keep it steady. Don’t tighten the first screw firmly in place, you want to wait to tighten it completely until the final screw is in as well. No matter what project you are working on, it’s always a good idea to slowly tighten the screws as this will help you avoid stripping them. Repeat this for the remainder of the brackets. 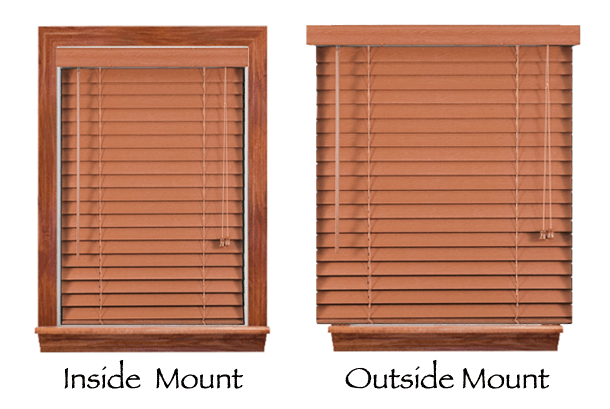 For an inside mount, you’ll also want to make sure that the hardware is spaced evenly in the depth of the window sill as well. Otherwise your blind will sit crookedly in the window and potentially scrape against the window frame as it’s opened and closed. Now that the brackets are installed, you are ready to hang the blind. Remember to read the instructions prior to hanging so you understand how the blind fits into the brackets. Some brackets are flimsier than others and could be damaged if you try to put the blind in the wrong way. If your blind is over 60 inches, you may need another set of hands to hang it. The wider the blind the harder it is to hold by yourself. Plus some brackets are tricky, and require you to hold the blind just so to connect the two. Additionally, the wider the blind the heavier it can be become. This is especially true for wood and faux wood blinds. They can get downright heavy and it’ll be nice to have someone else to share the weight with. Jiggle the blind around slightly to make sure you’ve got it firmly in the brackets. Otherwise it might fall down on you. Some brackets make a definite snap noise when the blind is securely in place. Once the blind is successfully in the window you are done! Open and close the blind, making sure all parts work smoothly. If you have a problem, alert the company immediately so it can be fixed. You have a limited amount of time, before any problems are your sole responsibility.